Armed with her unshaking faith in God and no pay, Jacqueline Reed started the Westside Health Authority in the summer of 1988. Twenty years and a $7.5 million building later, local officials honored Reed last week by naming a street in her honor. Ald. Emma Mitts (37th) nominated Reed based on her efforts and contributions to the West Side. Morris Reed, Jackie Reed and Ald. Mitts unveil one of the street signs earlier this month. Despite the cold weather, about 100 people gathered in the 5400 block of West Division Street between Long and Pine avenues for the street unveiling. 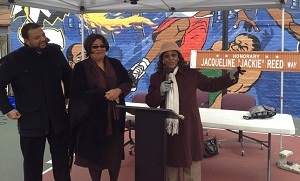 Honorary Jacqueline Reed street signs were placed at 5400, 5417 and 5500 West Division Street. “I remember the park before it was a park. It was in the mud . . . But things are changing, not as fast as we’d like them to, but they are changing,” Ald. Mitt said as she stood in the park located near the Westside Health Authority’s administrative office building, community technology center and youth development center. The organization – which operates a wellness center, a computer lab that offers technology training, a youth development program, and community re-entry and employment assistance – has grown to 50-plus employees and provides services to more than 22,000 people every year. Imani Johnson was among four former Westside Health Authority clients who spoke at the Dec. 6th street unveiling about how Reed impacted their lives. “The Westside Health Authority has made a big difference in my life; it helped me to become the successful person that I am today,” said the 18-year-old. Johnson, now an administrative assistant at Westside Health Authority, has benefited from programs offered at the social service agency, which has six offices in Austin, since she was 6 years old. 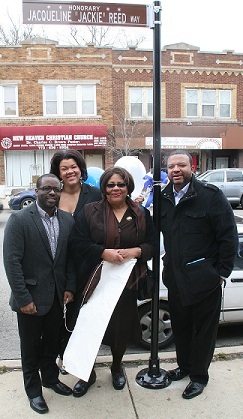 Donnell Reed Lighthall, Quiwanna Bell (Reed's daughter), Jackie Reed and Morris Reed (Reed's son and successor at Westside Health Authority) stand where one of the street signs will be posted. Morris Reed, who became chief executive officer after his mother retired earlier this year, said her leadership has brought together people from all walks of life to work as a community to address critical issues. A lot of people want to help, but they don’t know how to, and her leadership has been pivotal in showing how an individual can make a contribution, he said. “Everyone has a responsibility to help their community,” is one of the most valuable lessons Morris Reed said he learned from his mother. Many of her former employees describe Reed as being faithful, inspiring and – most of all – humble. “Instead of complaining about a problem, she tries to find a solution,” said Ken Johnson, director of development and communication. One of the organization’s main goals is to bridge a gap between what the government ought to do and what people should do for each other, Jacqueline Reed said. “If you get busy worried what others think, it becomes a distraction from what matters most,” Reed said. 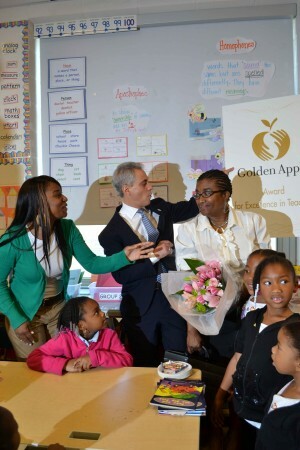 First-grade teacher Monique Blakes was one of 10 educators throughout the state to receive the award recognizing outstanding performance.